When windows 7 user first time use windows 8 and when he need to shutdown he will look for start button to shutdown windows 8. But all we know that there is not start button in windows 8, so here in this article I will show you the three ways to shutdown a windows 8 computer. 1. Click the mouse on right lower corner of your desktop, a menu will appear click on setting. From lower next menu click on power button and choose shutdown for shutdown. Or simply use the shortcut key windows-key + I for same menu. 2. You can shutdown windows 8 from command prompt using command “shutdown /s /t 0”. Open run console by pressing windows key+ r from keyboard and type the cmd for command prompt. Once command prompt is open type the command “shutdown /s /t 0” to shutdown, where 0 is representing the delay time, in this case windows will shutdown immediately. 3. One more way is to press ctrl+Alt+del and then choose shutdown. 4. 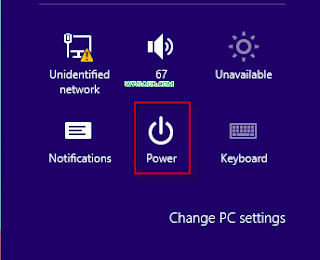 Another way to shutdown windows 8 is that you first sign out your user from start menu which will appear when you press windows key from keyboard. At login screen you will find the shutdown button at lower right corner of your computer from where you can restart, hibernate or put the system to sleep whatever you want.